Choose a nylon, trim, piping, and text or monogram (optional) color. ?Hand or machine wash, gentle cycle. No bleach. Tumble dry. 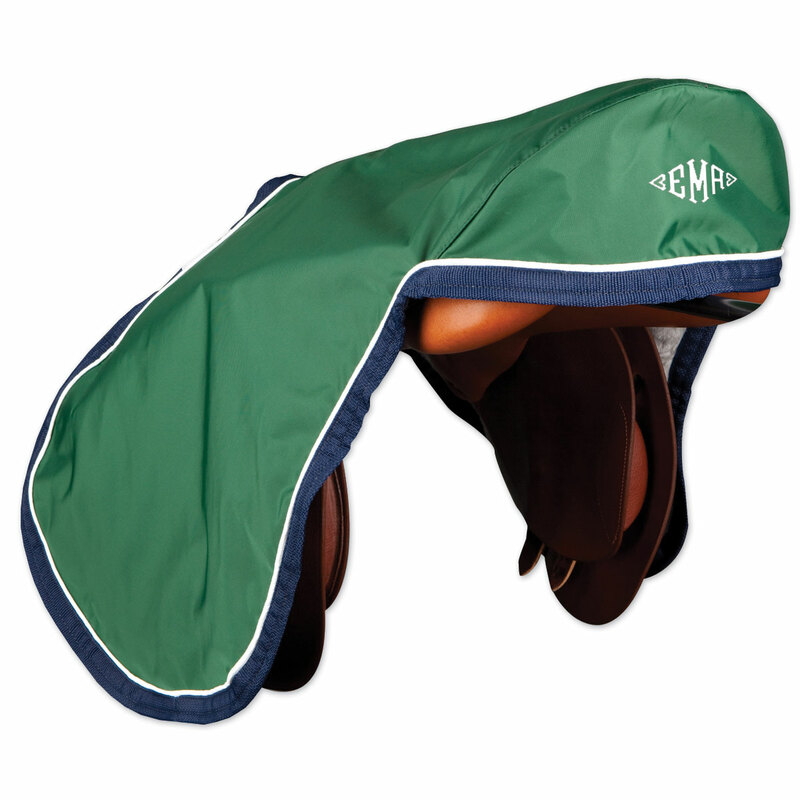 SmartPak Custom Saddle Cover is rated 4.6 out of 5 by 28. Rated 4 out of 5 by horsegoddess1 from GREAT AND JUST AS I ORDERED. I special ordered with my favorite colors and am very pleased with the colors, workmanship and quality. Rated 5 out of 5 by IsaInDC from Love it Worth the long wait. Looks more elegant AND protects my saddle better than the fitted saddle cover I had bought as a stopgap. I got my horse's name embroidered at the back. Rated 5 out of 5 by Theflyingdq from Awesome I have had this cover for a year now and just ordered a second one. My most expensive saddle sits on the rack by the light switch,, and everyone who has ever come in and out of a busy tack room with a handful of tack knows what that means! But this cover has kept my saddle from harms way . . . and it's sturdy and stable enough, thanks to the shaped cantle, to protect from the cat that sneaks into the warm room every now and then! Rated 5 out of 5 by CoastalHorse from No more dusty saddle!! I purchased this Saddle Cover in the AP size, and it fits my Wintec AP 500 quite well. I ordered the Cover in red with black trim and yellow piping, and it is stunning!! The red is nice and bright, and the Cover looks quite sharp in my dark tack room. Although a monogram is available, I did not order one, but I'm sure one would look nice. I wish the straps were adjustable or detachable, but that's a minor point. The Cover is fleece-lined, and all stitching is nice and tight. In addition, the Cover is machine-washable. Would make a lovely gift!!! I'm very pleased with this Cover, and I think you will be, too!! Rated 4 out of 5 by Jess from Great quality, mediocre practicality While the quality and workmanship are very very good on this cover, I do miss the elastic around the edges to keep it in place. Rated 4 out of 5 by diceuf from A little snug on an extra forward flap I purchased this in the close contact size for my jumping saddle, which has an extra long and extra forward flap. The nylon straps that hold the cover on are not really long enough to go around the flaps so it's a little difficult to get the cover on an off. The material itself is great, the underside is nice and soft and the embroidery looks great. I imagine it would fit a regular flap just fine. The straps are not velcro, so you have to slide them around the flaps. I'll probably have a velcro piece sewn onto mine to make it easier. Rated 5 out of 5 by sbc9 from This cover is so great I have three! I absolutely adore my smartpak saddle covers- they are super easy to use and fit the dressage saddles perfectly. I have ordered two more since the first one I bought and I am planning on giving one as a gift to a student soon! Rated 5 out of 5 by LittleSecret from love, Love, LOVE!!! I had been eyeing this saddle cover for a while and thanks to some store credit I finally bought one and I absolutly LOVE it! I got the custome colors and they all look great, no suprises. Shipping didn't take as long as expected which was a deffinate plus. The only thing I would change is maybe adding velco to the staps, they're a little hard to get on and off. I've recommended this cover to everyone and they all love it too! Rated 5 out of 5 by LittleSecret from crazy in LOVE!!! I have been dreaming of this saddle cover for over a year and thanks to some store credit I finally made the purchase! This saddle cover is wonderful all around! I wanted a saddle cover that didnt have the elastice on it but would still cover my saddle and stay on, this met all the requirements! I did the custom colors which I was a little worried about but it turned out beautifully and I got my name across the back and its just to die for! All my friends now want one and rave about how great it looks. The only thing I woud change is maybe having the nylon straps be velroable so its easier to get on and off. However Im so in love with it I dont care or mind :) If your are contemplating getting this dont even hesitate just buy! Plus Smartpak is so wonderful to work with you have nothing to worry about if you do have issues with it. Thanks SmartPak!! !